This new space of the Muzeum Sztuki is located in the historic building of a 19th century weaving plant. 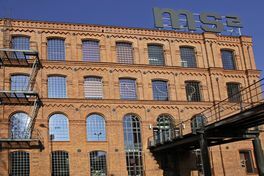 ms² is primarily a venue for experimenting with the Collection of 20th and 21st Century Art. The unique collection of the Museum is presented in an unconventional way: instead of a chronological lecture on the development of art, works of art representing various periods and movements are arranged into a story touching themes and motifs important for the contemporary public. The permanent exhibition is a ‘work in progress’, constantly subject to alterations, rearranged by invited curators and artists themselves. ms² also features temporary exhibitions, workshops, lectures, meetings with artists and film screenings. The building also houses Boston Café and an artistic bookshop, mała litera art.